Have you ever had one of those buttered popcorn-flavored jelly beans? They’re super weird . . . but some people love ’em and some people think they’re the worst thing that’s ever been made. Well, if you’re in the first camp, good news . 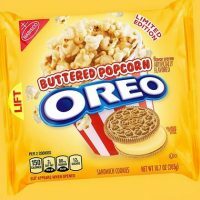 . . that flavor is coming to Oreos.